According to the records, mosaic patterns first appeared over 4000 years ago with the appearance of terracotta pieces painted for decorative purposes. Of course, mosaic patterns are alive and well today, too, perhaps making them one of the most long-lasting trends in home décor to ever exist. Considering this, you might want to use this ancient art style in your own home. If you’re not sure how to create a mosaic in the first place, you could follow this basic guide. Now you know how to mosaic, here are our top 3 ways to use them around your home. If you’re looking to create a centrepiece for your garden, a good way to achieve it is with a beautiful leafy mosaic table which is sure to enhance the natural theme of your garden. The best way to make your leaf tiles is to use a real leaf as a model – here’s a good tutorial to show you how. Because of your table’s new damage-proof top, you can decorate it with outdoor jar candles like these ones which will reflect beautifully off your mosaic table top. A bathroom is an excellent place to make the most of a mosaic pattern. An important tip to remember is that you need to pick a tile size that matches the size of your bathroom; a smaller tile will make your room look more spacious. 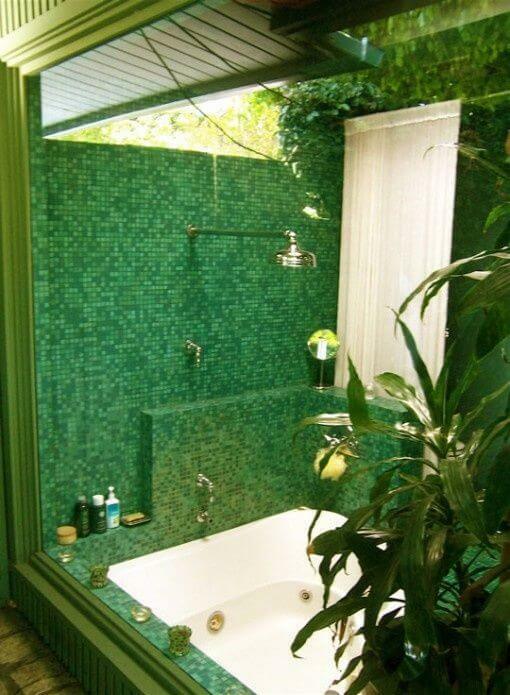 If you’re going for a jungle-themed, natural showering experience like this one, use a variety of small green, blue and brown mosaic tiles, and emphasise the trend using some rainforest potted plants and natural, exotic soaps. If you do, you’re bound to feel at one with nature. If you want a trendy, cosmopolitan kitchen but you’re really not sure what to do with your walls, you could mosaic them using a stylish dark slate colour. You might want to resort to a professional mosaic tile likes the ones from Tiles 4 All for this one because it could take you a long time to produce your own individual mosaic pieces. Still, finishing off this look with chic metal appliances and trendy down-lights will give your kitchen a real cosmopolitan feel. So hopefully, you’ve now got a better understanding of how you can improve your home with mosaics, so get creative with this ancient trend and your house will become more stylish as a result.